There was a time when keeping a diary was a popular pastime—everyone from teenagers to artists to world explorers did it diligently. These days, I’d wager that just as many people publish their daily thoughts and activities on blogs and Twitter as keep private diaries and writings in a notebook. CallitADay offers a middle ground that both groups might find appealing. It’s a program for keeping a daily journal, but one that’s flexible enough to let you store other content, as well—and even publish some of that content to the Web. Before creating any journal entries(which CallitADay calls notes) you should create topics for grouping related types of content. Each topic gets its own section in CallitADay’s sidebar. 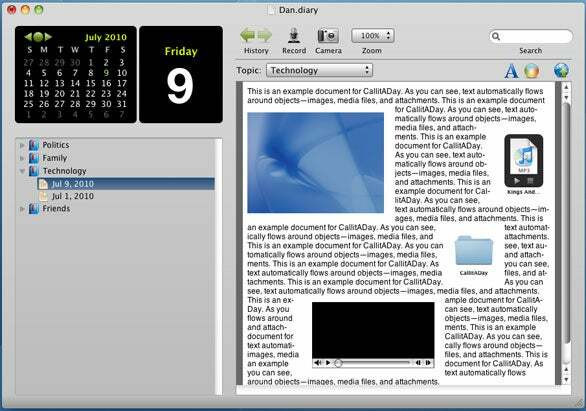 To create a new note, click the desired date in CallitADay’s calendar, choose the appropriate topic area, and then start typing. CallitADay’s Snippets feature lets you save bits of frequently used text and then paste those bits into any note using menu-bar or contextual-menu commands. To browse past notes, you can either click a date on the main calendar (calendar days are color coded to make it easier to see which dates include journal entries) or browse the index of topics below the calendar. Within each topic, notes are sorted by date. If you click a topic, rather than a date, you can browse notes within that topic using either thumbnail or Cover Flow views. History buttons let you quickly flip through the most-recently accessed notes. You can also rename notes to make it easier to find them using CallitADay’s search feature. When typing a note, you get the standard Mac OS X text-formatting options, but notes can contain more than just text. For example, you can drag an image or video into any note, and the media will appear exactly where you drop it. You can also resize the image or video, and move it around within the note—as with Apple’s Pages program, text automatically flows around the item. Click a video’s Play button to watch. CallitADay also includes features for recording audio and, if you have an iSight or other USB camera connected, for taking photos. The resulting images and audio files are treated as attachments in the current note. CallitADay’s Search command lets you search for notes containing your search term, and a separate Find command lets you find text within notes. The Find feature works much like the one in Safari: All instances of a found word are highlighted, with the rest of the note dimmed. You can skip between found instances using the keyboard or Previous and Next buttons. Finally, if you maintain a Wordpress blog, you can also publish a note to your blog as a blog entry by simply clicking CallitADay’s Publish button. As elegant as CallitADay’s interface is, I did come across some notable limitations. For example, there doesn’t appear to be a way to create multiple notes within a category on the same date. And unlike Memoires, you can’t encrypt your diary files to keep them private; you need to save them to, say, an encrypted disk image, which is a bit of a hassle.